Autumn (or “fall” as it is called here) has come and school has started up again after a good hot summer. It’s been a full summer for us and we’re glad for things to start settling a bit, not to mention glad for a hint of some cooler weather. I bet it won’t be long before we’re pining for the crazy heat of summer! 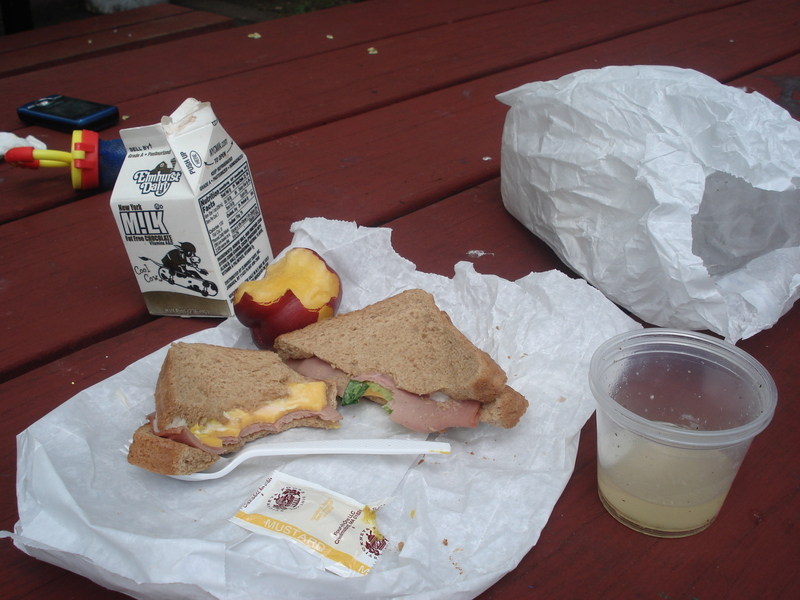 Another fun thing to have discovered was that some playgrounds give you free lunch! 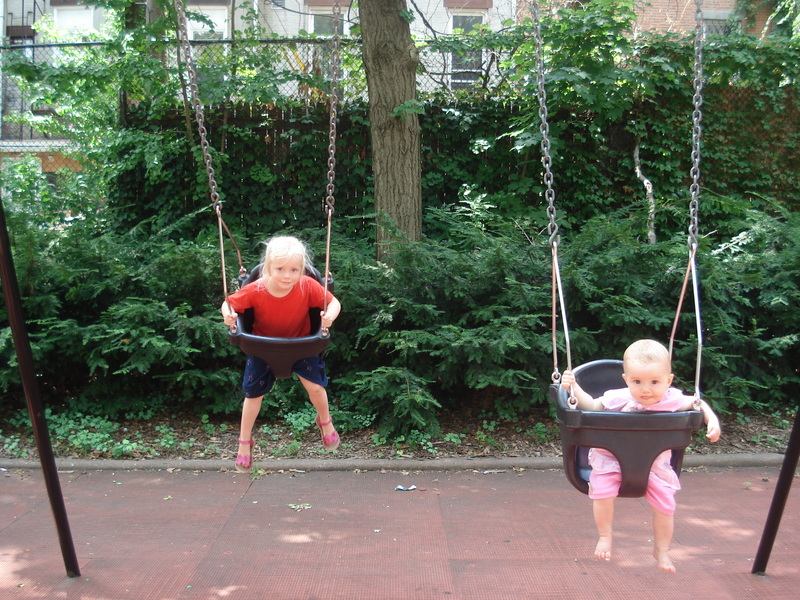 New York City has an incentive that all children under 17 are entitled to free lunch at certain playgrounds or centres. We enjoyed many of these (I even got some sometimes as they had to get rid of the lunches in a certain time frame and if there weren’t enough kids, they’d give lunches to the adults too!) The lunches weren’t fantastic, but certainly nice enough! You’d get a little white paper bag with a chocolate milk, a piece of fruit or a vegetable salad or some carrot sticks and a sandwich. 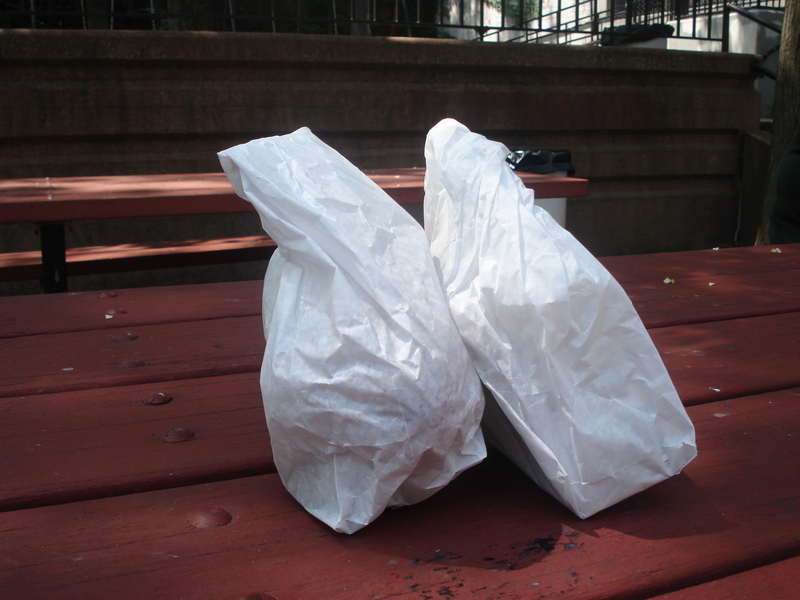 The sandwiches sometimes had cold meat on it, or cheese, or PB&J. Far too much food for a 3-year-old! Down here is the remains of a carton of chocolate milk, a half-eaten luncheon and cheese sandwich, a nectarine and a pottle of bean salad. ← Two nights + 14 people + 1 (small) New York apartment = Lots of fun! Weird, but nice of NYC! Free. Yeah, right. Just shows how so much more can be spent when bureaucracy takes over: 1) the wasted food and 2) I bet the lunches seldom help those who are really needy (financially and/or nutritionally). And on a global scale the United Nations is considering an attempt to redistribute wealth internationally by an international tax on currency transactions: huge income for their highly questionable and controversial Millennium Development Goals. Heh, that’s nice and cynical, Mum. :-) You’re probably more or less right on both counts — Franci says some of the kids are really picky about food, so a good amount ends up in the rubbish. My take is simply that we pay hefty taxes, especially here in NYC, so let’s use it! About the UN, that’s typical, though I’m sure the rich will find ways around it if they implement something like that.